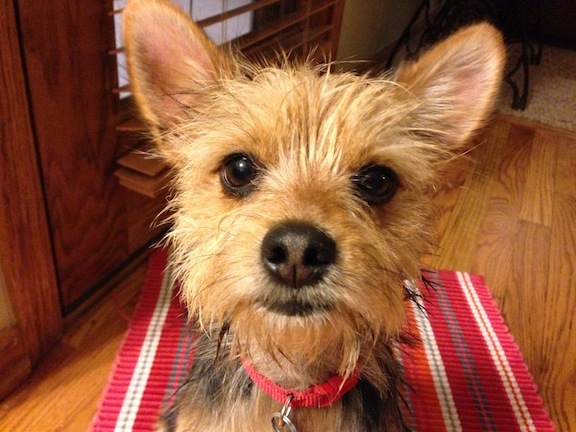 Oscar is a one-and-a-half year old Yorkshire terrier mix. His owners contacted me to help with his over-barking whenever anyone arrived or passed in front of their home. They also wanted me to put an end to his accidents in the house. When we sat down to discuss the situation Oscar was very nosy, literally sticking his nose into my bag to investigate all the interesting smells. One of the boys in the home attempted to correct him, but he didn’t pay him much attention. When I see a dog who over-barks and doesn’t listen to his owners I know that dog does not respect it’s owner’s authority. Oscar’s body language made it quite clear that he understood that he was loved by his owners, but for dogs respect of authority is crucial. To help Oscar see his humans as his pack leader, I demonstrated a leadership exercise that I use with many of my clients. It took only two repetitions before Oscar understood what I was asking for. At that point I coached each member of the family through the exercise. By repeating this leadership exercise daily, Oscar will not only learn see his humans as his pack leader, he will learn how to restrain himself. This is an important skill to master for dogs who have a tendency to bark at any movement. To stop Oscar from barking at the door, I showed his owners how to claim the door and entry-way. I had one of the boys go around to the front of the house and knock on the front door while ringing the doorbell as many times as possible. As soon as Oscar heard the first knock, he rushed to the door barking excitedly. I calmly walked over to the entryway and got between Oscar and the front door. I walked towards Oscar, taking his space and forcing him to back away further and further from the door. The farther away he got, the less Oscar barked. When he got to an appropriate distance I stopped and then slowly moved back towards the door. Every time that Oscar would bark or start to walk towards the door, I turned around and made a sound so he know that I disagreed with his action. It only took three corrections before Oscar stayed at the distance that I was asking him to respect. Once he did this I turned and opened up the front door. I coached the members the family through this exercise so that they can repeat it anytime any of them come home. The more practice they have at correcting Oscar and moving him away from the door whenever it rings, the faster he will stop over-barking at passers by. Next we went outside so that I could give them a few pointers on how to properly walk Oscar on the leash. Since Oscar is most reactive when he sees people or other dogs, I was hoping that perhaps we may run into one or the other in the neighborhood. After going over the proper position and leash corrections of the walk, one of Oscars owners asked their neighbor if they would mind bringing out their eight-year-old, small breed dog. As soon as he saw him, Oscar started barking in an aggressive way. I have to admit for a little guy, he’s quite determined. After correcting him several times I finally took him over to the neighbor’s dog Charlie. Oscar continued to bark and did not respond to my disagreements or corrections so I spun Oscar around and positioned him so that Charlie would be able to sniff Oscar’s rear end. When two dogs are meeting or facing off, whoever gets sniffed first is the more subordinate. By placing Oscar into the subordinate position, he immediately stopped his aggressive behavior and barking. After that he was able to run around, jump and play with Charlie without incident. We let both dogs off the leash in Oscar’s backyard and they played quite nicely together. However as time went by, Oscar’s energy level started to increase so I stepped in and made him sit for a moment until he calmed down. As soon as he did, I let him go and the two continued playing nicely. It’s important that we monitor dogs, especially when they have different energy levels or are a different ages such as eight-year-old Charlie and one and a half year-old Oscar. After the neighbors left, we went back inside and I offered if you a few pointers on how to add some structure to Oscar’s mealtime. Because Oscar had been free-fed, he only ate little bits sporadically throughout the day. When dogs are domesticated they lose a little bit of their hunter instinct which isn’t necessarily a bad thing. However if a dog isn’t balanced, it can develop into some eating disorders – usually not eating enough. By removing the food if the dog does not eat or anytime a dog walks away from its bowl during meal time, it will quickly learn to consume the food that is offered, when it is offered. Oscar may hold out for a meal or two in protest, but eventually hunger kicks in and the dog will begin to eat everything placed in his bowl when it is offered to him. Once Oscars is on a regular eating schedule, his owners can chart the amount of time that it takes before he needs to have a bowel movement. Dogs usually have a pretty regular digestive system, so once we determine how long it takes a dog to digest a meal we know exactly when to take the dog outside to make sure that it doesn’t have an accident in the house. At the end of the session Oscar was either laying down napping or sitting very peacefully. Due to his ability to comprehend the leadership exercise, combined with his responsiveness to the new methods of correction and communication, I anticipate Oscar’s days of over barking and pooping in the house will soon be a thing of the past.